Animals or Machines: Whom Do You Love? I was young then and had seen little of the world, but when I heard that cry my heart turned over. It was not the cry of the hawk I had captured; for, by shifting my position against the sun, I was now seeing further up. Straight out of the sun’s eye, where she must have been soaring restlessly above us for untold hours, hurtled his mate. And from far up, ringing from peak to peak of the summits over us, came a cry of such unutterable and ecstatic joy that it sounds down across the years and tingles among the cups on my quiet breakfast table. I submitted a Letter to the Editor that was set to appear in the December 12 issue of The New Yorker, but then, at the last minute, it was bumped in favor of something to do with Trump. I’m saving it for another opportunity. 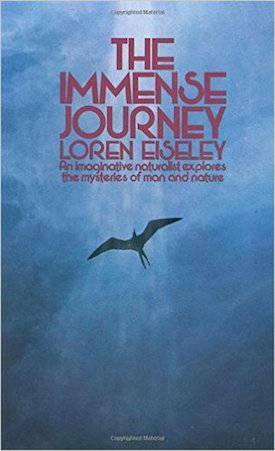 In “Not Our Kind,” Heller quotes a passage from the anthropologist and naturalist Loren Eiseley, whose writings thrilled and educated me deeply in the 1960s, when I discovered his book The Immense Journey. This book includes an essay called “The Bird and the Machine.” After reading Heller’s article, I reread “The Bird and the Machine” in my 1957 edition of the book. The Immense Journey was first published in 1946 and is still in print. Thank goodness. "Remembering those two birds and that blue mountain sunlight..."
I suppose their little bones have years ago been lost among the stones and winds of those high glacial pastures. I suppose their feathers blew eventually into the piles of tumbleweed beneath the straggling cattle fences and rotted there in the mountain snows, along with dead steers and all the other things that drift to an end in the corners of the wire. I do not quite know why I should be thinking of birds over the New York Times at breakfast, particularly the birds of my youth half a continent away. It is a funny thing what the brain will do with memories and how it will treasure them and finally bring them into an odd juxtaposition with other things, as though it wanted to make a design, or get some meaning out of them, whether you want it or not, or even see it. It used to seem marvelous to me, but I read now that there are machines that can do these things in a small way, machines that can crawl about like animals, and that it may not be long now until they do more things—maybe even make themselves—I saw that piece in the Times just now. And then they will, maybe—well, who knows—but you read about it more and more with no one making any protest, and already they can add better than we and reach up and hear things thought the dark and finger the guns over the night sky. This is the new world that I read about at breakfast. This is the world that confronts me in my biological books and journals, until there are times when I sit quietly in my chair and try to hear the little purr of the cogs in my head and the tubes flaring and dying as the messages go through them and the circuits snap shut or open. This is the great age, make no mistake about it; the robot has been born somewhat appropriately along with the atom bomb, and the brain they say now is just another type of more complicated feedback system. The engineers have its basic principles worked out; it’s mechanical, you know; nothing to get superstitious about; and man can always improve on nature once he gets the idea. Well, he’s got it all right and that’s why, I guess, that I sit here in my chair, with the article crunched in my hand, remembering those two birds and that blue mountain sunlight. There is another magazine article on my desk that reads “Machines Are Getting Smarter Every Day.” I don’t deny it, but I’ll stick with the birds. It’s life I believe in, not machines. The idea took on with a vengeance. Little automatons toured the county—dolls controlled by clockwork. Clocks described as little worlds were taken on tours by their designers. They were made up of moving figures, shifting scenes and other remarkable devices. The life of the cell was unknown. Man, whether he was conceived as possessing a soul or not, moved and jerked about like these tiny puppets. A human being thought of himself in terms of his own tools and implements. He had been fashioned like the puppets he produced and was only a more clever model made by a greater designer. Then in the nineteenth century, the cell was discovered, and the single machine in its turn was found to be the product of millions of infinitesimal machines—the cells. Now, finally, the cell itself dissolves away into an abstract chemical machine—and that into some intangible, inexpressible flow of energy. The secret seems to lurk all about, the wheels get smaller and smaller, and they turn more rapidly, but when you try to seize it the life is gone—and so, by popular definition, some would say that life was never there in the first place. The wheels and the cogs are the secret and we can make them better in time—machines that will run faster and more accurately than real mice to real cheese. I have no doubt it can be done, though a mouse harvesting seeds on an autumn thistle is to me a fine sight and more complicated, I think, in his multiform actively, than a machine “mouse” running a maze. Also, I like to think of the possible shape of the future brooding in mice, just as it brooded once in a rather ordinary mousy insectivore who became a man. It leaves a nice fine indeterminate sense of wonder that even an electronic brain hasn’t got, because you know perfectly well that if the electronic brain changes, it will be because of something man has done to it. But what man will do to himself he doesn’t really know. A certain scale of time and a ghostly intangible thing called change are ticking in him. Powers and potentialities like the oak in the seed, or a red and awful ruin. Either way, it’s impressive; and the mouse has it, too. Or those birds, I’ll never forget those birds—yet before I measured their significance, I learned the lesson of time first of all. I was young then and left alone in a great desert—part of an expedition that had scattered its men over several hundred miles in order to carry on research more effectively. I learned there that time is a series of planes existing superficially in the same universe. The tempo is a human illusion, a subjective clock ticking in our own kind of protoplasm. As the long months passed, I began to live on the slower planes and to observe more readily what passed for life there. I sauntered, I passed more and more slowly up and down the canyons in the dry baking heat of midsummer. I slumbered for long hours in the shade of huge brown boulders that had gathered in tilted companies out on the flats. I had forgotten the world of men and the world had forgotten me. Now and then I found a skull in the canyons, and these justified my remaining there. I took a serene cold interest in these discoveries. I had come, like many a naturalist before me, to view life with a wary and subdued attention. I had grown to take pleasure in the divested bone. I sat once on a high ridge that fell away before me into a waste of sand dunes. I sat through hours of a long afternoon. Finally, as I glanced beside my boot an indistinct configuration caught my eye. It was a coiled rattlesnake, a big one. How long he had sat with me I do not know. I had not frightened him. We were both locked in a sleep-walking tempo of the earlier world, baking in the same high air and sunshine. Perhaps he had been there when I came. He slept on as I left, his coils, so ill discerned by me, dissolving once more among the stones and gravel from which I had barely made him out. Another time I got on a higher ridge, among some tough little wind-warped pines half covered over with sand in a basin-like depression that caught everything carried by the air up to those heights. There were a few thin bones of birds, some cracked shells of indeterminable age, and the knotty fingers of pine roots bulged out of shape from their long and agonizing grasp upon the crevices of the rock. I lay under the pines in the sparse shade and went to sleep once more. It grew cold finally, for autumn was in the air by then, and the few things that lived thereabouts were sinking down into an even chillier scale of time. In the moments between sleeping and waking I saw the roots about me and slowly, slowly, a foot in what seemed many centuries, I moved my sleep-stiffened hands over the scaling bark and lifted my numbed face after the vanishing sun. I was a great awkward thing of knots and aching limbs, trapped up there in some long, patient endurance that involved the necessity of putting living fingers into rock and by slow, aching expansion bursting those rocks asunder. I suppose, so thin and slow was the time of my pulse by then, that I might have stayed on to drift still deeper into the lower cadences of the frost, or the crystalline life that glisters in pebbles, or shines in a snowflake, or dreams in the meteoric iron between the worlds. It was a dim descent, but time was present in it. Somewhere far down in that scale the notion stuck me that one might come the other way. Not many months thereafter I joined some colleagues heading higher into a remote windy tableland where huge bones were reputed to protrude like boulders from the turf. I had drowsed with reptiles and moved with the century-long pulse of trees; now, lethargically, I was climbing back up some invisible ladder of quickening hours. There had been talk of birds in connection with my duties. Birds are intense, fast-living creatures—reptiles, I suppose one might say, that have escaped out of the heavy sleep of time, transformed fairy creatures dancing over sunlit meadows. It is a youthful fancy, no doubt, but because of something that happened up there among the escarpments of that range, it remains with me a lifelong impression. I can never bear to see a bird imprisoned. We came into that valley through the trailing mists of a spring night. It was a place that looked as though it might never have known the foot of man, but our scouts has been ahead of us and we knew all about the abandoned cabin of stone that lay far up on one hillside. It has been built in the land rush of the last century and then lost to the cattlemen again as the marginal soils failed to take to the plow. There were spots like this all over that country. Lost graves marked by unlettered stones and old corroding rim-fire cartridge cases lying where somebody had made a stand among the boulders that rimmed the valley. They are all that remains of the range wars; the men are under the stones now. I could see our cavalcade winding in and out through the mist below us: torches, the reflection of the truck lights on our collecting tins, and the far-off bumping of a loose dinosaur thigh bone in the bottom of a trailer. I stood on a rock a moment looking down and thinking what it cost in money and equipment to capture the past. We had, in addition, instructions to lay hands on the present. The word had come through to get them alive—birds, reptiles, anything. A zoo somewhere abroad needed restocking. It was one of those reciprocal matters in which science involves itself. Maybe our museum needed a stray ostrich egg and this was the payoff. Anyhow, my job was to help capture some birds and that was why I was there before the trucks. The cabin had not been occupied for years. We intended to clean it out and live in it, but there were holes in the roof and the birds had come in and were roosting in the rafters. You could depend on it in a place like this where everything blew away, and even a bird needed some place out of the weather and away from coyotes. A cabin going back to nature in a wild place draws them till they come in, listening at the eaves, I imagine, pecking softly among the shingles till they find a hole and then suddenly the place is theirs and man is forgotten. Sometimes of late years I find myself thinking the most beautiful sight in the world might be the birds taking over New York after the last man has run away to the hills. I will never live to see it, of course, but I know just how it will sound because I’ve lived up high and I know the sort of watch birds keep on us. I’ve listened to sparrows tapping tentatively on the outside of air conditioners when they thought no one was listening, and I know how other birds test the vibrations that come up to them through the television aerials. Well, to come back, I got the door open softly and I had the spotlight all ready to turn on and blind whatever birds there were so they couldn’t see to get out through the roof. I had a short piece of ladder to put against the far wall where there was a shelf on which I expected to make the biggest haul. I had all the information I needed just like any skilled assassin. I pushed the door open, the hinges squeaking only a little. A bird or two stirred—I could hear them—but nothing flew and there was a faint starlight though the holes in the roof. I padded across the floor, got the ladder up and the light ready, and slithered up the ladder till my head and arms were over the shelf. Everything was dark as pitch except for the starlight at the little place back of the shelf near the eaves. With the light to blind them, they’d never make it. I had them. I reached my arm carefully over in order to be ready to seize whatever was there and I put the flash on the edge of the shelf where it would stand by itself when I turned it on. That way I’d be able to use both hands. Everything worked perfectly except for one detail—I didn’t know what kind of birds were there. I never thought about it at all, and it wouldn’t have mattered if I had. My orders were to get something interesting. I snapped on the flash and sure enough there was a great beating and feathers flying, but instead of my having them, they, or rather he, had me. He had my hand, that is, and for a small hawk not much bigger than my fist he was doing all right. I heard him give one short metallic cry when the light went on and my hand descended on the bird beside him; after that he was busy with his claws and his beak was sunk in my thumb. In the struggle I knocked the lamp over on the shelf, and his mate got her sight back and whisked neatly through the hole in the roof and off among the stars outside. It all happened in fifteen seconds and you might think I would have fallen down the ladder, but no, I had a professional assassin’s reputation to keep up, and the bird, of course, made the mistake of thinking the hand was the enemy and not the eyes behind it. He chewed my thumb up pretty effectively and lacerated my hand with his claws, but in the end I got him, having two hands to work with. He was a sparrow hawk and a fine young male in the prime of life. I was sorry not to catch the pair of them, but as I dripped blood and folded his wings carefully, holding him by the back so that he couldn’t strike again, I had to admit the two of them might have been more than I could have handled under the circumstances. The little fellow had saved his mate by diverting me, and that was that. He was born to it, and made no outcry now, resting in my hand hopelessly, but peering toward me in the shadows behind the lamp with a fierce, almost indifferent glance. He neither gave nor expected mercy and something out of the high air passed from him to me, stirring a faint embarrassment. I quit looking into that eye and managed to get my huge carcass with its fist full of prey back down the ladder. I put the bird in a box too small to allow him to injure himself by struggle and walked out to welcome the arriving trucks. It had been a long day, and camp still to make in the darkness. In the morning that bird would be just another episode. He would go back with the bones in the truck to a small cage in a city where he would spend the rest of his life. And a good thing, too. I sucked my aching thumb and spat out some blood. An assassin has to get used to these things. I had a professional reputation to keep up. In the morning, with the change that comes on suddenly in that high country, the mist that had hovered below us in the valley was gone. The sky was a deep blue, and one could see for miles over the high outcroppings of stone. I was up early and brought the box in which the little hawk was imprisoned out onto the grass where I was building a cage. A wind as cool as a mountain spring ran over the grass and stirred my hair. It was a fine day to be alive. I looked up and all around and at the hole in the cabin roof out of which the other little hawk had fled. There was no sign of her anywhere that I could see. “Probably in the next county by now,” I thought cynically, but before beginning work I decided I’d have a look at my last night’s capture. Secretively, I looked again all around the camp and up and down and opened the box. I got him right out in my hand with his wings folded properly and I was careful not to startle him. He lay limp in my grasp and I could feel his heart pound under the feathers but he only looked beyond me and up. I saw him look that last look away beyond me into a sky so full of light that I could not follow his gaze. The little breeze flowed over me again, and nearby a mountain aspen shook all its tiny leaves. I suppose I must have had an idea then of what I was going to do, but I never let it come up into consciousness. I just reached over and laid the hawk on the grass. He lay there a long minute without hope, unmoving, his eyes still fixed on that blue vault above him. It must have been that he was already so far away in heart that that he never felt the release from my hand. He never even stood. He just lay with his breast against the grass. In the next second after that long minute he was gone. Like a flicker of light, he had vanished with my eyes full on him, but without actually seeing even a premonitory wing beat. He was gone straight into that towering emptiness of light and crystal that my eyes could scarcely bear to penetrate. For another long moment there was silence. I could not see him. The light was too intense. Then from far up somewhere a cry came ringing down. I saw them both now. He was rising fast to meet her. They met in a great soaring gyre that turned to a whirling circle and a dance of wings. Once more, just once, their two voices, joined in a harsh wild medley of question and response, struck and echoed against the pinnacles of the valley. Then they were gone forever somewhere into those upper regions beyond the eyes of men. All over the city the cogs in the hard, bright mechanisms have begun to turn. Figures move through computers, names are spelled out, a thoughtful machine selects the fingerprints of a wanted criminal from an array of thousands. In the laboratory an electronic mouse runs swiftly through a maze toward the cheese it can neither taste nor enjoy. On the second run it does better than a living mouse. On the other hand... Ah, my mind takes up, on the other hand the machine does not bleed, ache, hang for hours in the empty sky in a torment of hope to learn the fate of another machine, nor does it cry out with joy nor dance in the air with the fierce passion of a bird. Far off, over a distance greater than space, that remote cry from the heart of heaven makes a faint buzzing among my breakfast dishes and passes on and away.